Visconti fountain pens offering 39 unique pens with 650 of the finest white diamonds embellishing their Ripple HRH line starting at $57,000. US pen dealer PowerfulPens.com is now offering and shipping these limited edition fountain pens from Italy making them available to pen collectors in America. Visconti pens has handcrafted one of the most mesmerizing pieces to ever feature in select international fountain pen collections and the Ripple HRH speaks to the continued highest-standards set by Visconti pens. The Ripple HRH is a truly exclusive masterpiece with a unique and captivating detail of gold and jewels to be a focal point in fountain pen collections of the highest caliber. More than a luxury writing instrument, the Ripple HRH is the highest standard in luxury fountain pens. 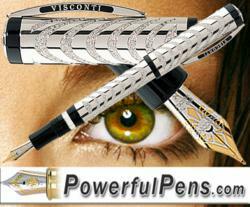 Visconti fountain pens are known for their Italian heritage and intensive handcrafted process of production. Fountain pen collection curators can immediately identify the level of quality and care that has gone into the crafting of such an exquisite piece. Custom design and excessive diamonds ripple across the surface of the gold barrel to a degree of being excess without losing the panache of elegance and sophistication that a pen of this caliber demands. Simplistic design creates an allure of couture professionalism that can be felt in the weight and the laying of the ink across a page. Exclusivity knows the Ripple HRH well with only 39 fountain pens of this type available. A double reservoir and power filler system makes this masterpiece simple to use and a pleasure to feature in any fountain pen collection of high standard. Visconti fountain pens spare no expense in setting new records for quality, craftsmanship and innovation to dazzle international fountain pen aficionados. Visconti reputation of providing collectors with only the best of the best can be plainly observed in the Ripple HRH from the limited quantity, highest quality and detail that was invested into this symbol of luxury. Flexibility in a Visconti fountain pen nib is determined in several ways. First, thickness of the nib is important. Second, the curve of a nib determines in part of stiff the nib will be. Third, the "breather hole" size, shape, and position alter the stiffness.Fourth, the length of the tines determines how far they may spread under pressure. Fifth, the alloy used can affect stiffness, steel is stiffer than gold alloys (those with un-tipped steel points will wear more rapidly due to abrasion by the paper), and more pure gold (18k, 21k) is softer than diluted gold. Always protect your fountain pens with quality pen boxes or pen cases. The gold barrel and 18K gold nib are key aspects in the progressively valuable addition to fountain pen connoisseurs' collections. As markets have fluctuated in response to news, politics and financial situations around the globe, the materials that anchor and even propel the value of the Ripple HRH are notably tied to the steady and rising value of gold bullion. These two industries, luxury fountain pens and gold and silver bullion, have been observed consistently for several years. These correlated markets have been a considerable asset to the best fountain pens admired by collectors globally. Pen collectors can contact PowerfulPens.com for current selection and pricing at 1-888-960-6665 or visit their online store http://www.PowerfulPens.com.